What To Eat Before Thanksgiving + 2 Year Blog Anniversary!! First of all, I completely missed my two year blog anniversary of Tuna Toast which was November 11th! I can’t believe it’s been that long since I posted my first attempt at French macarons in teeny tiny font (what was I thinking?). And although my photography skills still leave a lot to be desired (as you’ll see in this post!!) I just want to thank all of the readers for sticking around and reading my rants on various topics. It’s still something I love to do and I hope there’s at least another two years left in Tuna Toast. So one could argue that this week is the biggest eating week of the year. Thanksgiving is a time for turkey, mashed potatoes, squash, sweet potatoes, roasted veggies, stuffing, gravy, cranberry sauce, pumpkin pie……….yikes, yeah, that’s a lot of grub. Since J and I know we’re going to get our eats on this Thursday (and probably Friday, Saturday and Sunday cos nothin’ is better than turkey leftovers!) we want to prep for the feast by keeping things light until then. My friend N is currently a bachelor since his fiancee is in Japan taking care of her parents. He’ll join her next week, but in the meantime I thought he was probably living on Cup Ramen so we invited him over for some Japanese food last night. 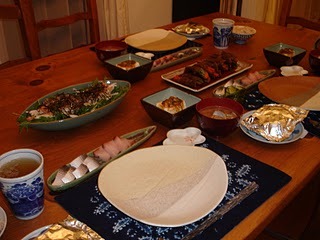 I love making Japanese meals with small amounts of many different things- it’s a great way to eat since it keeps your mouth busy with different flavors. It’s also quite healthy since everything is light but you never miss anything since there’s such a variety of items. 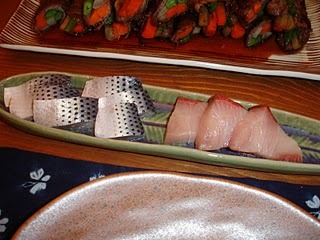 It’s also nice to share a Japanese meal with a Japanese friend since maybe it reminds them of their “ofukuro no aji” or “the flavor of my mother.” Or maybe it’s flava, ha! Cooking like this also gives me a chance to use the many Japanese plates and bowls we got for our wedding almost six years ago, which is fun. 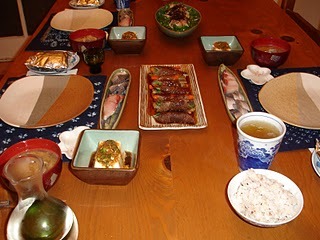 Tonight we’ll be eating Japanese food too, and then it’s two more days til the feast! Can’t wait! 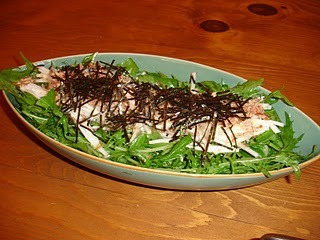 This entry was posted in healthy cooking, Japanese cooking. Bookmark the permalink. I agree – eating light, non-American foods is the best thing to do leading up to Thanksgiving. That way, you are totally ready for the flavors and over-eating that’s involved with the holiday! ahhh!!! You amde the beef rolls again! Nom nom nom! It was simply awesome! Arigatou Tuna Toast chan! Neko mo kawaii-katta.